As iconic a symbol of NYC as the Empire State Building, Brooklyn Bridge is, I think, the most magnificent of the bridges across the East River linking Manhattan to Brooklyn. Having always wanted to walk across it, this trip we managed to tick that one off. An early start on a frosty morning, we took the subway to City Hall – another first for us and a real treat for Son. The entrance to the bridge at Center Street was easy to find and we made our way onto the pedestrianized walkway right in the middle between huge stone pylons and a spiderweb of steel support cables. Traffic flows below so no cars to think about, you can just focus on those views. We spied Governors Island to the south, the Manhattan Bridge to the north and Brooklyn ahead. 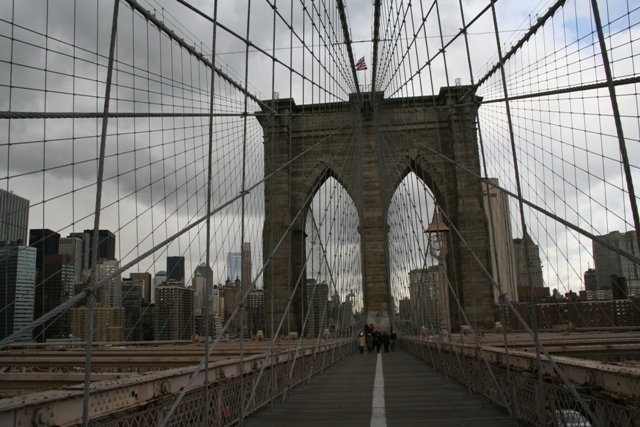 When Brooklyn Bridge opened in 1883 after 14 years of construction it was the largest suspension bridge in the world. The span between its two support towers is 1,596 feet and it still dazzles – definitely one of the architectural gems of New York in my humble opinion. Our stroll was on an icy winter’s day. Despite multiple layers and barely an inch of flesh showing anywhere, we were frozen. 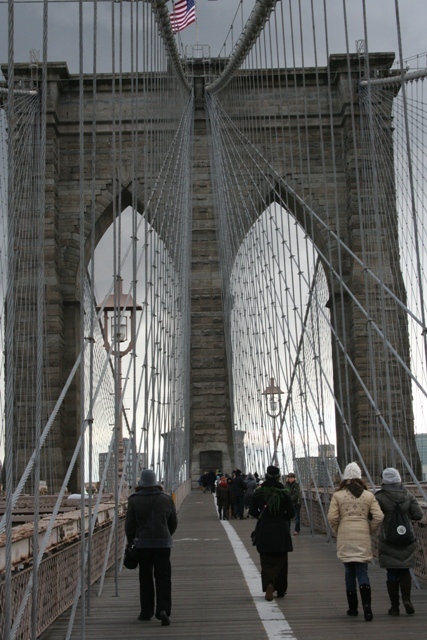 Make sure you sport your super thermals if you brave the bridge in winter – temperatures are bracing to say the least. 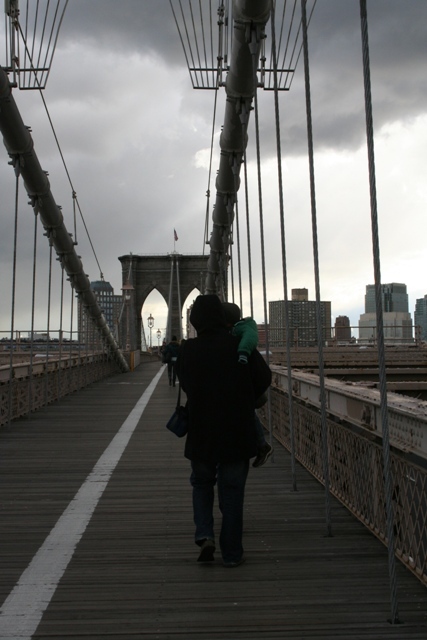 Our original plan was to walk over the bridge and explore Brooklyn before crossing back later in the day. It is about a mile long so not a taxing distance but Son was so cold and so miserable once we reached the Brooklyn side, we decided to turn and walk back again. The walk back to Manhattan is really what it’s all about – walking back over the bridge you get a true sense of the city, seeing it as it should be seen. The majestic beauty of that skyline is just mind blowing. 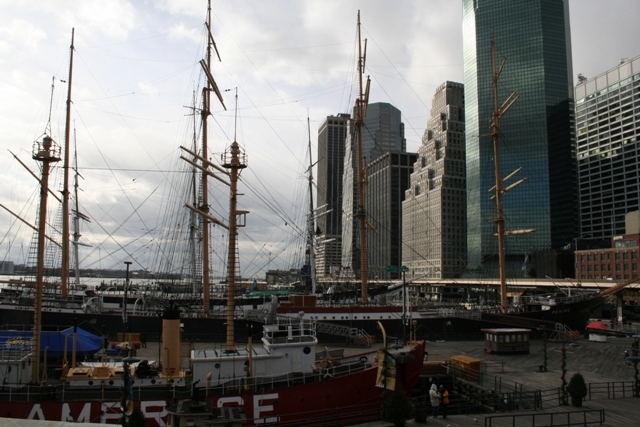 Back in Manhattan we decided to head to South Street Seaport and Pier 17, only a short walk away and the perfect place to grab a coffee and thaw out. We browsed a little in the shops there, then found some great views over the water and across to the bridge on the upstairs terrace area. I loved this stroll – not only an engineering marvel with a fascinating history but a romantic and iconic suspension bridge, crossing it is a walk with a wow – definitely not to be missed. It was – fabulous views despite the sub zero temperatures!! Wow, that’s cold. Not very comfortable on a bridge anyway. It’s amazing – you just get the most gorgeous views of the skyline. Highly recommended!! Amazing views but soooo chilly – surprised we didn’t get frostbite!! Summer in NYC sounds good to me – we need to try out a warmer season there now!! There were some people on the bridge when we crossed but definitely not crowded like it seems it was when you were there – it was so cold though, probably that’s why!! Spring sounds like it would be a good option!! 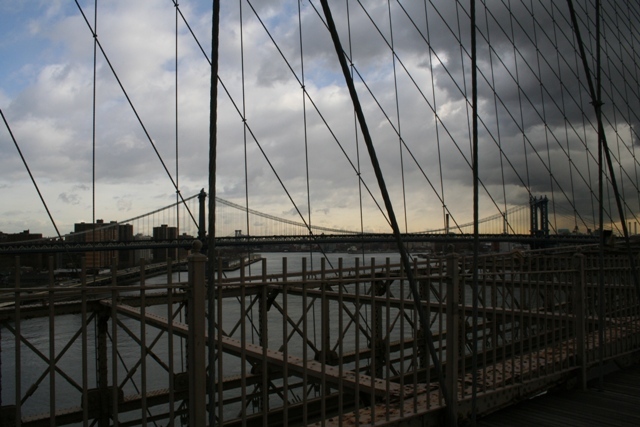 Your photos almost look black and white with the suspension cables against the overcast skies–great mood. I like toward the end when blue skies appeared, too. Great experience, well told. It was such a grey and dark day I took stacks of pictures but most of them were awful – I thought these looked black and white too!! The blue sky was very welcome at the end too but it was still freezing. Still a great experience, would love to cross the bridge again in summer someday. It is such a superb city to visit, definitely something for everyone!! I highly recommend, we’ve been several times and always loved it. 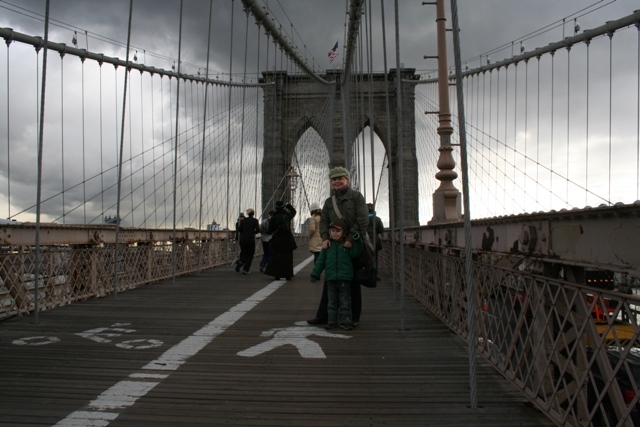 Walking over the Brooklyn Bridge and strolling the elevated walkways are at the tip top of my To Do list for when we return to NYC as a family. We are hoping to go back for a long weekend this year so hopefully I will get to do it. 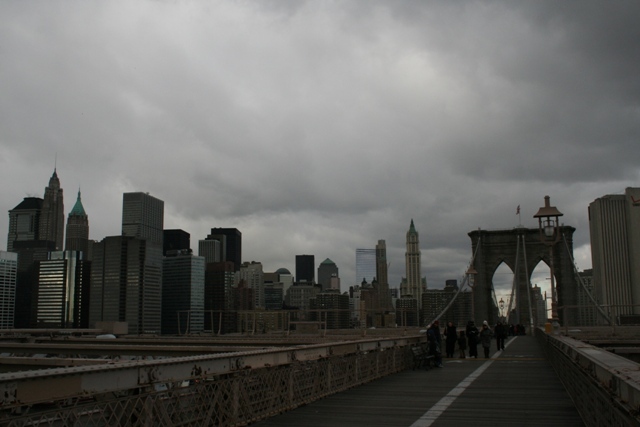 I loved this walk Laura – the views are wonderful and there is something really special about being on the Brooklyn Bridge. I had just finished reading a book set in the time it was built – someone froze to death in the story on the bridge, I thought at one point we might suffer the same fate!! Freezing temperatures notwithstanding it was fun and so memorable, I think your family would love it too. Looking forward to reading about your weekend in NYC!! I love seeing NYC through your eyes, Joy. New York City never fails to fascinate! 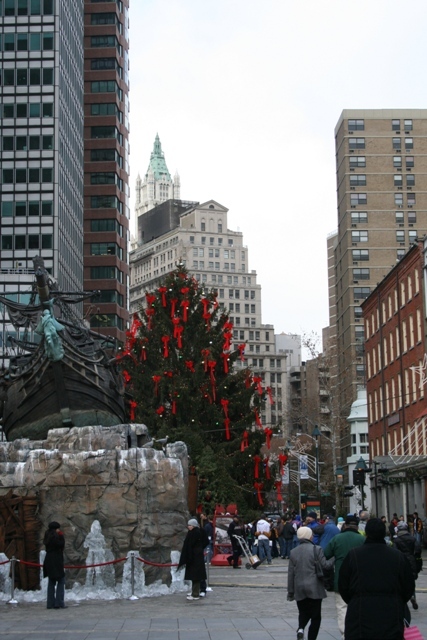 Thank you Pam – it’s a wonderful city, we can’t get enough of it!! Looks very fun (but cold) 🙂 Thanks for the great tips about the logistics! Soooo cold – but that made it a bit different and special for us too! It was such a grey and dark day but seemed to fit well here with the bridge! 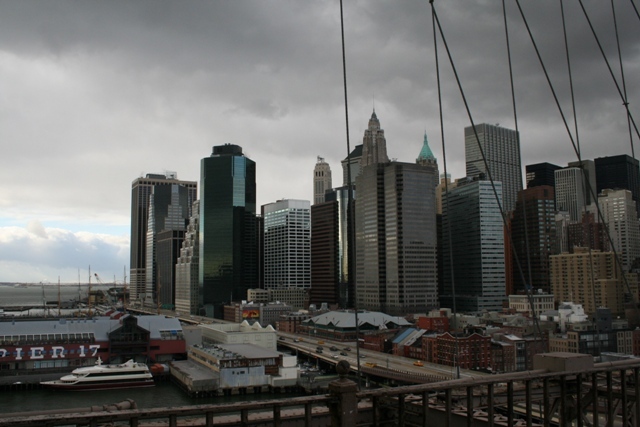 Thank you – it’s such a great place for the best views of Manhattan! From there, the view on Manhanttan skyline must have been incredible ! We saw the skyline from the water on the ferry and from the Top of the Rock and Empire State – however my favourite skyline view was from here. It’s incredible – spine tingling really and pictures can’t do it justice. It was one of my favourite things to do in New York Rosemary and probably my favourite view of the city (most likely because I felt as if I knew it, having “seen” it so many times on screen etc. before). The cold surprised me – I knew it would be icy but we shivered the whole week!! Visit in summer if you don’t like wearing multiple layers of thermals would be my advice! Hope your daughter is enjoying London – pretty cold there too at the minute too!! I love how different the buildings around the Bridge are, the patchwork of textures make them so interesting… thanks for sharing!!! It’s a fabulous view – like you say so interesting and arresting at the same time. Thanks for dropping by!! We’d seen it from further away on previous visits to NYC but walking over it was such a great and fun experience – I definitely recommend. You just see everything so much better and the views are amazing. 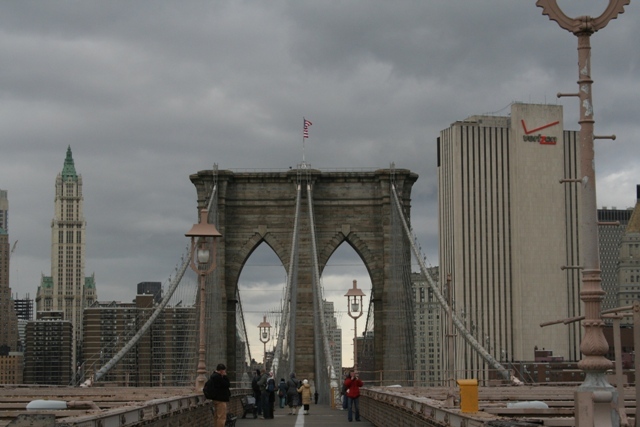 I read a novel set in New York at the time the Brooklyn Bridge was being built – fascinating and it had a lot of historical facts in there, I remember reading about the workers with the bends!! Think that was part of the attraction of walking over the bridge but we all enjoyed it so much. Would love to do it again – just in warmer weather!! I look forward to walking across this bridge, spectacular. I think Joy you would enjoy reading the history of the bridge’s construction – definitely a unique story. I’ve read a little about the history and a novel set around the time it was built which had some historical facts thrown in for good measure. What I know already has whetted my appetite – I now should seek out the whole story! wow you were there on a day of crazy clouds!! if you’re ever there in the summer maybe you can catch the tug-o-war game between manhattan and brooklyn. it’s complete chaos but fun! That sounds amazing – would love to see that!! We’ve been in summer but many years ago, think it’s time for a return trip in warmer weather! !